Although Puerto Rico may only be the size of Connecticut, this Caribbean island is constantly pulsating with life. Just a two hour flight from the continental US, Puerto Rico exudes a mix of Spanish, African and Indian charm, and although it may have strong connections with the US, it is able to retain a strong sense of its Latino identity. Puerto Rico is blessed with a varied landscape, from looming mountains to dense rain forests to white sandy beaches, and it is these pristine shores that tend to attract the most visitors. Thanks to the pressure from many local environmental groups, development in the area has been limited, allowing the idyllic coastlines to remain relatively untouched. While the tranquil waters of Boquerón Beach are perfect for families, those who want more seclusion will be delighted by Las Paldas and La Jungla, as well as El Convento Beach, with its nesting sea turtles, colorful coral and plenty of marine life. Visitors should also make it a point to visit Flamenco Beach in Culebra, named as being one of the best beaches in the world by Discovery Channel. In addition to its beaches, Puerto Rico boasts many other natural wonders, including its three bioluminescent bays, which put on a natural dancing light show every night. You will also find the one and only rainforest on the US Forest Service’s system in Puerto Rico – the El Yunque Rainforest, with walking trails leading to a magnificent waterfall and a large, natural swimming pool, perfect for enjoying a cooling dip. The cooler, mountainous regions are also worth exploring, with their Spanish hill towns, coffee plantations, and horse ranches that raise some of the finest horses in America. San Juan, Puerto Rico’s capital, is where to go for a healthy dose of culture, with a variety of museums to keep you busy. From the African Heritage Museum to the Museum of Colonial Architecture to the San Juan Museum of Art and History, each one of these gives you a unique insight into Puerto Rico’s past. The Spanish fortresses of El Morro and San Cristobal in Old San Juan remain enclosed by a wall that was built in the 16th Century, and is a delight to explore for a first hand experience of a bygone era. Puerto Rico’s second largest city is Ponce, otherwise known as the Pearl of the South, and its Plaza de las Delicias is one of the liveliest squares on the island. The nightlife throughout Puerto Rico is abundant, as are the number of restaurants, so you can rest assured that you will always be discovering delightful new eateries. The local cuisine is Spanish-based, and although you will find many traditional restaurants, Puerto Rican cuisine is being taken to new levels thanks to innovative local chefs that have taken international cooking TV shows by storm. With delicious food, unbelievable natural beauty and a strong cultural heart, Puerto Rico is the ideal destination for both a short break, as well as a longer vacation. The vibrant, buzzing capital of Puerto Rico, San Juan and its population of almost four million people is the largest urban area on the island. Central San Juan has much in common with a standard American metropolis, with criss-crossing highways, towering high-rise buildings, and the only subway system on the island. 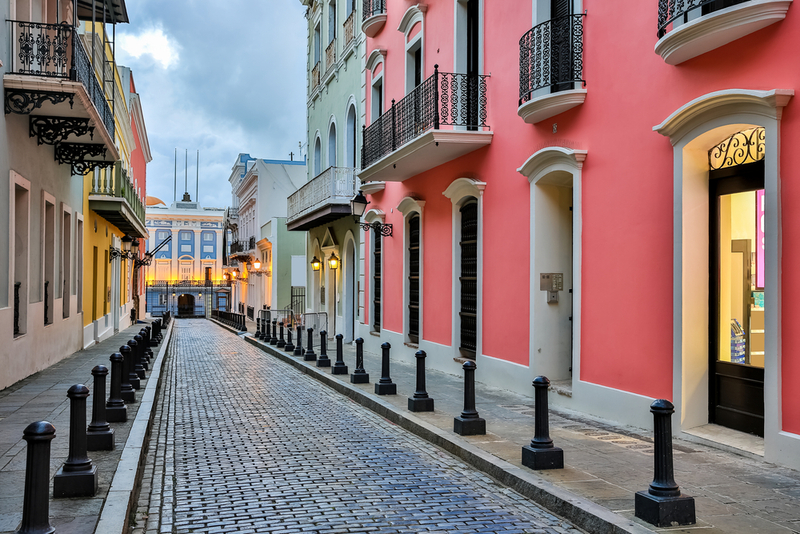 However, the cultural and historical heart of the city lies in the walled Old San Juan, with its cobbled streets, Spanish colonial architecture and roads lined with colorful tropical flowers decorating the brightly painted houses. 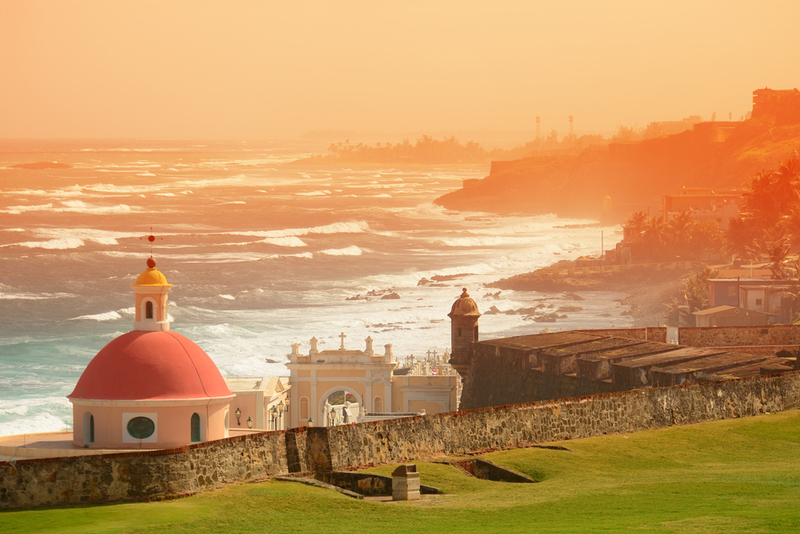 For a better insight into the city’s complex past, a visit to El Morro, an old Spanish fortress, is worthwhile, as is a trip to some of San Juan’s museums, such as the National Gallery and the Museum of San Juan, while those with children will definitely want to stop off at the Children’s Museum. San Juan also has some great beaches, with the best ones being Isla Verde, with the Bacardi Distillery being just a short ferry ride away, Luquillo Beach, popular with families, and Condado. With a well-established surf scene, San Juan attracts surfers from all over the world, but, thanks to certain areas with calmer water, is a great destination for beginners who want to try out the sport. When it comes to shopping, you can expect to find plenty of bargains in San Juan, from local crafts to luxury clothing. You will also never be short of somewhere to eat, as well as for somewhere to party the night away, as restaurants and nightclubs are a huge part of the city’s lifestyle. Whether you’re in San Juan to soak up some culture before exploring more of the island, or are staying in the city for your vacation, you will no doubt thoroughly enjoy your Puerto Rican experience.